Ok, the photo is a bit misleading. If you want to make the bread, you won't find the recipe in this book -- you'll need to go here. But what goes better with a fresh loaf of bread, especially this time of year, than a good bowl of soup? Souped Up! , by Molly Sampson, is, hands-down, the best soup cookbook I've read. 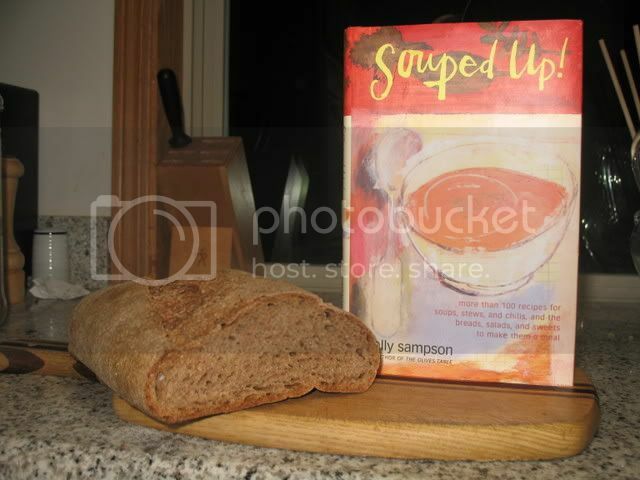 In fact, as cookbooks go, I'd hold up Souped Up! as a model for the genre. Really -- it's a masterpiece. Right now in Oregon, it's wet and chilly and, back in my adopted home of New England, it's cold and snowy. This time of year, nothing sounds better for dinner than soup, salad and a fresh loaf of bread. Heck, I roast a chicken a couple of times a month and, to be honest, more than 50 percent of my motivation is the fresh chicken stock I can make from the carcass. It uses common ingredients: I really hate it when I get excited about cooking something for dinner only to discover that it requires some exotic ingredient like chipotles in adobo sauce or truffle oil or smoked paprika or pomegranate vinegar. I'm sure there are places in the Southwest where chipotles in adobo sauce are as common a pantry staple as pimento cheese was in my Southern home, but there definitely aren't any chipotles in adobo sauce at my grocery store and I'm not going to order a can over the Internet for a single dish. Souped Up! uses easy-to-find ingredients that are probably already in your fridge or pantry. They don't get much more exotic than an occasional head of fennel, a bunch of fresh cilantro or some smoked turkey. It's not a coffee table book: The Bread Baker's Apprentice really is the glaring exception to this rule, but I generally find that, the more pretty pictures a cookbook has, the less useful the cookbook is for actual cooking. Souped Up! is laid out simply, but attractively, with ingredients, dish names and cup yield in red, and everything else in black. There are no pictures of soup, which, I suppose, isn't surprising. Soup usually isn't all that photogenic. The more than 100 soups are delicious: Really. They are. Especially the bean soups. Though there are some soups, the cream soups, for instance, that can be made in under an hour, for most of her soups, Sampson recommends letting them simmer for hours. It really does make a difference. The book is written simply and well: Sampson doesn't wax eloquently about Italian varieties of beans or the particular pleasures of a certain herb. She's all business. Each recipe has a brief introduction or anecdote, but the meat of the book is the recipes, which are clear and concise. The book also contains salad suggestions, which is more of a toolkit than a collection of recipes, salad dressings, a handful of quick breads and seven desserts. I've not tried any of the quickbreads, though I did attempt to make her brownies, and was disappointed. But, really, this is a book about soup. The rest are just extras. Here's a couple of recipes that I've particularly enjoyed. A word of advice, she mostly assumes you'll be using stock that's already salted, so, if you're like me and you make your own stock without salt, you'll need to "salt to taste." Place a heavy-bottomed stockpot over medium heat and, when it is hot, add the butter or oil. When the butter has melted, add the onion, celery, carrots, and herbs and cook until tender, about 10-15 minutes. Add the stock, raise the heat to high, and bring to a boil. Lower the heat to low, and cook, uncovered, for 1 hour. Add the rice or pasta and cook until tender, about 20 minutes. Add the chicken, stir, and cook until heated through, about 20 minutes. Serve immediately, or cover and refrigerate up to three days. Place a stockpot over medium heat and, when it is hot, add the butter. When the butter has melted, add the onion and cook until tender, about 10-15 minutes. Add the potatoes, split peas, dried thyme and stock, raise the heat to high, and bring to a boil. Add the smoked turkey, lower the heat to low and cook, partially covered, until the peas have completely fallen apart, about 2 to 2.5 hours. Stir occasionally. Skim off any foam that forms. Add the cream. If you wish to freeze, do so before adding the cream. Serve immediately or transfer to a container, cover and refrigerate for up to three days. Garnish with fresh thyme. I'd be remiss if I didn't include a link to my favorite chicken stock recipe. Not that the one in the book isn't good (and she doesn't insist that one make one's own stock -- quite to the contrary), but I've not found a recipe as simple and tasty as this one. I use a chicken carcass post-roast. Also good is the vegetable stock recipe in Souped Up!. So ... care to share your favorite soup to go with fresh bread? I'll have to check my library to see if it's available or maybe get a used copy on amazon? I could eat soup three or four times a week in the winter. It's cold where I am now - in Omaha - 26 degrees today and 2 to 4 inches of snow tomorrow. I also grew up on Pimento Cheese! Nashville, TN - Thanks for the tip. It's well worth checking out! Mmmm, Pimento cheese. (To be honest, I never developed a taste for the stuff, though my parents ate pimento cheese sandwiches all the time. Probably for the best, since I'm not sure it can be found anywhere outside the confines of a Piggly Wiggly. Everything OK for you and yours? I was thinking about you yesterday when I glanced at the news before going to bed and saw the horrible scene on my screen. Family and I are fine - however one of the women shot and killed worked at the same company as me, NP Dodge Real Estate. (I work in the corporate office.) She left behind three kids and a husband. Her youngest has CF and needs breathing therapy twice a week and it's $1,000 out of the parents' pockets every week! The company has canceled the yearly holiday party and will donate the money they would have spent to the family. The whole thing has been kind of surreal to tell you the truth...we are slowly getting back to normal here. I will have to give this book a try. This time of year soup and stew with some bread to dunk is one of my faves. I just checked out a Williams-sonoma soup/stew book that is quite good. I have also discovered braising. Talk about simple and tasty. I just discovered braising, myself, last year, and now I won't cook broccoli or brussels sprouts any other way. Isn't it tasty?! For Brussels sprouts, cut them in half and heat up some oil in a pan that you've sprinkled with salt. Place the Brussels sprouts cut side down and keep them over high heat for about 5 minutes, until the cut side has browned or blackened. Remove from heat and pour in either 1/4 cup apple cider, or 1 Tbs honey or maple syrup mixed with 3 Tbs water. Cover immediately. Serve after about 5 minutes. I'm a big fan of this combination. Some of the soups we make often have a sizable quantity of another starch - rice, pasta, etc. We tend to not eat bread with them. Two of my favorites, though, are krupnik, an Eastern European soup with beef or lamb, barley, lentils and various beans as well as onions, celary and carrots. This is best with rye bread or pumpernickel, and French onion soup with croutons made with bagette or pain au levain slices, covered with grated emmenthaler or gruyere and broiled until the cheese just starts to carmelize. The soup we make most often is chicken broth which I most often serve with matzoh meal latkes. I make them with scallions cut into 1" lengths and mixed in the batter. These days, I fry the latkes in olive oil, rather than schmaltz though, in violation of tradition. Another favorite soup is a potage - a french soup made with about 8 or so different vegatables, including cabbage and romain lettuce, and blended. The recipe comes from Patricia Wells' "Cooking in Provence," I think. Potage is a soup I've been meaning to make for some time, and never had. I'll have to check out Cooking in Provence. Thanks! I had had potage in France many times and loved it. But it always had a particular flavor - kind of nutty - that I could not identify. I thought maybe it was creme freche, but that didn't do it. 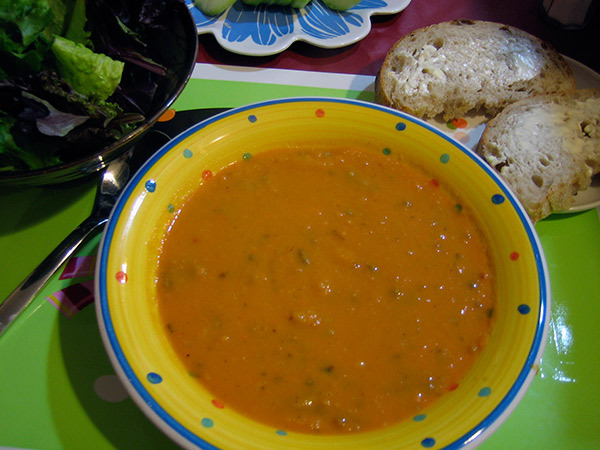 When I made Patricia Wells' potage recipe, this mysterious flavor turned up! Wow! It was ... turnips! I love soup! Any time of year it is a great meal so I'm always glad to know about another good soup cookbook. All this talk about sweet potatoes for holiday and after making Floyd's wonderful sweet potato rolls I had the urge to make a sweet potato soup which I had not done before. Here is the recipe I used and it is easy and soooooo yummy. We had a great loaf of fresh bread to dunk into it and I highly recommend it. Remove sausage from casings and break into sauté pan. Sauté in olive oil until browned and remove onto paper towels to drain. Add onion to pan and sauté over medium heat until translucent. Add garlic and sauté about a minute. Add chopped potatoes and cook over medium heat for about 10 minutes or until they soften. Then add chicken broth, spices, salt and pepper and bring to a boil. Reduce heat to a simmer, cover and cook for about 20 minutes or until potatoes are cooked through. Use a potato masher or an immersion blender to blend about 3/4 of the potatoes leaving a few larger pieces of potato in the soup. Add cream if using it. Then add the sausage into the soup and heat through. Note: You can use all sweet potatoes or any combination of sweet potatoes with white potatoes either Yukon gold or russet. Btw, I grew up eating pimento cheese in those tiny jars at my grandmother's house. Funny as I was just thinking about it the other day and wondered if they still make it. Side note, Trish, if you see this I was sure thinking about you yesterday and everyone else I know that lives here in Omaha. We live about 5 minutes from that mall and shop often at Von Maur. Our hearts go out to everyone in the entire community. That sounds *really* good. I may have to give it a try soon. I made this tonight. Excellent! I cut a few corners, ingredient-wise: I have store brand paprika, not Hungarian paprika and I used regular pork Italian sausages and whole milk instead of cream, but I don't believe the soup suffered any from it. Thank you again for posting this! I'll definitely be making this one again. ... and it's delicious! Here's my write-up. I'm so glad you guys both tried this and enjoyed it. I love the silky texture of it. Floyd that looks really wonderful and makes me hungry for it all over again. I'm sure I'll make it all winter. This is a recipe you can really play around with and use what you have on hand and the soup won't suffer at all. JMonkey, I did have a batards I'd bake from Danielle Forestier's French bread recipe and I added 75 grams of leftover sourdough starter plus I usually splash in a little WW and rye - just a touch. That is really a good recipe and was outstanding with the soup. Also, I think your choice of spinach would be fabu. In fact, you could even drop some chopped, fresh spinach into the soup at the end. I think chives would be a good addition and also maybe adding thyme while cooking. If you don't have an immersion blender (or as some people call them, boat motor) I can't recommend them more highly. It prevents ever again having to dump hot liquids into a blender to puree. You do it right in the pan, or in the can (tomatoes, etc) and have complete control over how much you puree something to get the texture perfect. I was surprised how often I actually use mine and you don't have to get an expensive one with all the attachments. It is one of the tools in my kitchen I can't do without. ZB- I couldn't believe it when this happened in our city - I've always thought of it as kind of an "overgrown" Mayberry. You know, friendly, safe etc... It will be a long time before any of us shops in a big store without thinking of this incident. By the way, for those of you who don't know, Von Maur, the store where this happed is one of our more upscale department stores. The Mall is located in a very nice area, as well. Glad you and yours are ok as well. I used hot Italian pork sausage because that was what I could find in the market. Because of this, I eliminated the spices. I substituted a rutabaga, a turnip, and a couple of carrots for some of the sweet potatoes. Because the sodium content of the lower-sodium Swanson's chicken broth was still high, I used a 32-ounce container and supplemented with two cups of water and some no-salt instant vegetable broth from my pantry. I was cooking it at the same time as I was baking semolina bread and the timers had me confused. But fortunately I had a five-channel timer from the Improvements catalog where you can record a short reminder with each setting. However, the bread was for something else and I was not able to eat it with the soup. Anyway, it wasn't done yet. I just love a good hearty soup. Thanks, ZB, for this great recipe! I also have a great soup book, "essential / Soup Recipes," by B. J. Hanson. It has over 300 soups. There is a good section on various broths to make, which are really important for a good foundation to make your own creative soups. When I make soup, I always make a big pot to last two nights. And good bread or rolls are definitely a part of the meal. Ah ... I'll have to reserve that one at the library as well. Thanks Ramona! As for leeks ... mmmmmm .... one of my longtime standbys is potato-leek soup. 8 leeks, two big potatoes, 2 Tbs butter, chicken stock and some salt. Cook the leeks in the butter until tender, add potatoes and stock, cook until the potatoes are tender and into the blender to puree. There are 3 things that can really stengthen potato & leek soup I've found. One is to render bacon for a garnish, and use the fat along with butter to saute the leeks. Another is to run the potatoes though a ricer instead of the blender which I find makes for a less gummy texture (a cheese grater works too, but really this is labor intensive, and I'd probably go for a few quick pulses in the blender over grating hot potatoes). And a dash of freshly grated nutmeg and cream at the end really helps bring the soup together. Anyone have Patricia Wells' potage recipe? I looked online but couldn't find the recipe. If anyone cares to post it I'd be happy. Thanks. Just thought I would let you know that Muir Glen puts out organic fire roasted tomatoes in cans and the really make a difference in soups, casseroles, chilis, etc. These tomatoes really add great savory flavor to food. I have used them to make a great garlic, tomato dill soup and a garlic, pasta spinach soup. I live in Maine and chipotles in adobo sauce are common. What better than that hot smoky flavor to warm up a cold day? It's zero right now. And white truffle oil sends things into another dimension. Kind of pricey, but a few drops goes a long ways. Especially on a cheesy soup or creamy pasta dish. MMM. Potage is just a general term for a hearty soup for any soup made with whatever you have on hand. Like potage du jour . They're generally made with braised vegetbles and thickened with some pureed vegetables. I think I'll make some tonight. Braised in duck fat. Maybe a few drops of truffle oil ? Time to go face the cold. I'm missing that kind of cold, right now. Bicycling to work in the morning past fields of snow, the bite of cold air on my cheek, the condensation forming ice on my glasses ... um ... OK, I can do with out the blindinice rime on my specs. But the rest, I really miss. I love Corvallis, but rain everyday with temperatures in the mid-30s and 40s will take a while to get used to. As for truffle oil and chipotles in adobo sauce, I don't have anything against them, per se. I'm sure they're tasty. I just have a personal bias towards cookbooks that are aimed toward the everyday and that use relatively cheap, easily procured ingredients. Ramona mentioned these and I have to agree, they are wonderful. I make a very quick soup using 1x14oz can of the fire roasted tomatoes, 1 can chicken broth and one can of coconut milk. Start by sauteeing 1/2 a chopped onion in olive oil, add 1 clove garlic, chopped. Next add 1/2t paprika ( I use more) and 1/2t dried oregano, cook for a few minutes and add the tomatoes, cook a few more minutes and add the chicken broth, simmer uncovered for 15 minutes. Puree then add the coconut milk and simmer. Great with fresh baked bread, your choice. Very warming on a cold day, A. Sliced lemon is also great in chicken or turkey stock. You can't taste the lemon at all, it just makes the flavor brighter. My poultry co-op sells necks or backs in 5 pound bags. I was amazed how meaty the parts were. They're in my freezer now waiting for my next stock making session. This is one of our favorite soups. I've never been able to find the Portuguese chourico but have substituted several other sausages. I've also used other greens when I couldn't find kale. cover and cook 5 minutes, stirring occasionally. medium and cook 5 to 10 minutes longer or until potatoes are tender. pronunciation), if you want to sample the chourico. Just curious -- about how big are your sweet potatoes? The ones I get here at my local grocery store are 1 to 1.5 pound MONSTERS, and I figured that six pounds of sweet potatoes might be a bit much for the recipe ... but, heck, I thought I'd ask. I made this tonight. 2 massive sweet potatoes were plenty. So sorry I did not see your message before. You guys did figure it out though! I weighed a potato I have left and it is about the same size as the ones I used - a little over 8 ounces. You have to use enough potato to make the soup a little thick so that's the main thing but other than that you can wing it! Weavershouse, glad you liked it, too. I'm going to have to try some of the other soups posted here. You can't ever get enough great soup especially with great bread! Jmonkey, I made the chicken rosemary soup tonight and it was fabulous! My wife and daughter said it was one of the best soups I have made. I also used turkey cutlets cut from breast meat which I browned slowly in a pan while the broth cooked. This tasted like I simmered it all day and it was under 2 hours start to finish. The SD rustic rolls I made this afternoon were perfect with it. Thanks for your continued efforts to showcase excellent dishes that go with fine breads. As it happens, I made chicken soup last night, too, though it was Chicken with Thyme, Lemon Zest and Potato. Nice and light. What a great book. I make a killer chicken soup but really it's mostly about browning the chicken, baking the bones a little and a long simmer. This recipe way more flavorful than my usual mix and it was quick. I liked the recipe so much and the other one you posted with with smoked turkey I ordered 3 books. I plan to send 2 as gifts to people I know who love soups. What a great recommendation, thanks!